Boston's dozen harbor islands lure day-trippers with swimming beaches, walking trails, great stone Civil War-era fortresses, picnic spots, and panoramas of Boston's skyline. 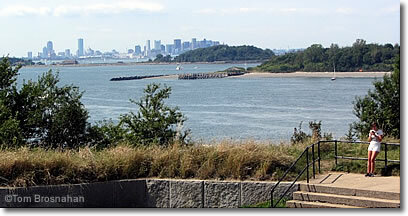 The Boston Harbor Islands make a great day-trip, especially for families: boat cruise, beach swim, walking, picnicking, even climbing on the walls of a great fortress. Bonus: the special feeling of being on an island. Bird's eye view of Boston Harbor & its Islands. 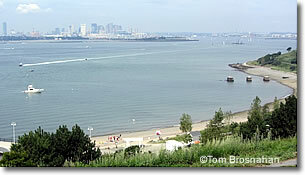 Best destinations for an island cruise are two of the largest: George's Island and Spectacle Island, both part of Boston National Historical Park. You can visit them both in an easy day's cruising. Ferryboats to the islands depart from Boston's Long Wharf, on the east side of the Marriott Long Wharf Hotel (map). To avoid disappointment, reserve your tickets online. You will have to decide on a departure time for your trip to the islands, and also the time of your return voyage. to the Boston skyline in the distance.